In Mafia 3, there are 10 districts to be conquered. In each district you will find various shops and collectibles. Each district has the same structure, the tasks don’t differ - only the story is different. The Boss Sal Marcano cannot take care of all the districts, so he has placed a gang in every zone that takes care of the business. In each district you will find two of them. For example: in the first district named Delray Hollow, there is a heroin and prostitute ring that you have to destroy. - Complete the displayed side missions. - Put money to this place, which you find on cupboards or tables. - Destroy targets. These special destinations will show you on the map and also damage the business. Stand in front of it and press the displayed button to destroy the targets. Each district has in each case informants, you must consult them in order to get information about the particular business. There are also executives who support their boss. Each shop has a boss, and the latter has an executor who can be killed. You cannot recruit the executioners. If you don’t kill them, they will rush to their bosses. Then you have to fight against him and the boss of the particular business. - As soon as you enter a new district, you meet with Donovan. Your buddy will give you important information about the governing gang and the shops. - Now choose a business and take the informants. Separate them from other enemies, for example by whistling and creeping towards them. Then you choose whether you want to kill or recruit them. If you decide for the first, you will get money immediately. The latter will bring you more revenue in the long term. - Now weaken the respective business, so that the revenues decrease to $ 0. For more money, you can repeat the submission several times, even if the income has already fallen to 0. - Then the boss is the boss. He is protected by an executioner. Take him so that the boss has less and less control over the district. - The boss you can either kill or recruit. The latter brings you long-term money and increases your income in the respective business. However, remember that you can only recruit the boss if you have been tapped the zone of the deal. You do not have to listen to the entire district. Just look near the shop a telephone system, which you can equip with wire-tap. - Now you can assign an underboss to the district. So if you want to increase your revenue in the district, you should recruit all the informants and gangsters. If you keep them alive, you will get more money in the long run. 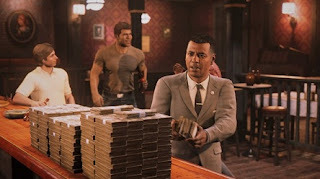 If you want to increase your revenue even further, you should complete the side missions, which will give you the maximum revenue. The district to the south, Bayou Fantom, cannot be conquered. Accordingly, you cannot assign an underboss here. The inner city, Barclay Mills and Tickfaw Harbor have finally a lieutenant of Marcano, you must fight. The last 3 districts bring you to Mafiabosses, which you must defeat, until you encounter Sal Marcano. After the first 3 districts, you will meet with all the subordinates when you have conquered a district. If you are already able to assign an underboss after conquering a business, but if the entire district is conquered, the underboss will be settled or recruited, you will have to hold a meeting in which you will finally decide which underboss will receive which business. This decision cannot be changed afterwards.